Law office conveniently located in Historic Germantown at 1308 Rosa Parks Blvd. with ample parking on site including handicap accessibility. 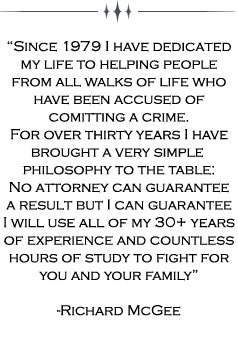 Richard McGee started his career as a criminal defense attorney in the Public Defender’s Office in Nashville in 1978. After five years he went into private practice where he has been for more than 25 years. During his three decades of practice he has been lead or co-counsel in over one hundred murder cases including death penalty cases. During the last two decades he was handled hundreds of drug cases and achieved a large number of dismissals based upon successful challenges to police searches – both with and without search warrant. He has represented numerous citizens accused of robbery, kidnapping, assault, embezzlement and theft. He is the former president of the Tennessee Association of Criminal Defense Lawyers and has been Chair of the Strike Force for TACDL for a number of years. He is a “Fellow” with the Nashville Bar Association. His appellate practice is extensive and successfully argued cases both the Tennessee Supreme Court and Court of Criminal Appeals. As an example was lead counsel in State v. Garcia, an interdiction case and numerous other cases involving searches and seizure litigation. He is a member of the Inns of Courts and of the Tennessee and Nashville Bar Association. He is a Senior facility instructor at the TACDL Trial College and a frequent presenter throughout and State on various criminal defense issues. His son, Kevin, was a Public Defender in Knoxville and Nashville. His daughter-in-law, Sarah, was also a Public Defender in Nashville, the first family to achieve this distinction! Prior to his teaching at the TACDL College he was an instructor at the National Institute for Trial Advocacy for ten years. He is a frequent guest lecturer at Vanderbilt University, and the Nashville School of Law. He is the monthly coordinator for a mentoring program for young lawyers in Nashville along with other members of his firm and wears the hat of mentor with great pride. He is constantly seeking to learn new techniques and presented at the TACDL Annual Conference in August, 2009-2012 on various topics including Story Telling, Cross-Examination, and Motions to Suppress. He headed up a teaching trip for lawyers in Guam in 2012. His capital experience is extensive. He was co-counsel in Donald Middlebrooks; Michael Bush; James Kimbrough; Eddie Hartman and Oscar Smith on Post-Conviction. The Hartman case alone was litigated for ten years. He was Chairman of the Tennessee Post Conviction for over ten years and served on the State Death Penalty Review Commission in 2010 He was also a member of the legal team in the Tennessee Death Row conditions lawsuit which succeeded in closing down the row for years. Richard McGee Attorney at Law is located in Nashville, TN and serves clients in and around Goodlettsville, Nashville, Antioch, Whites Creek, Madison and Davidson County.